It seems Samsung targeting all segments in their Android line up. They produce from high end, mid end to low end or entry level products. 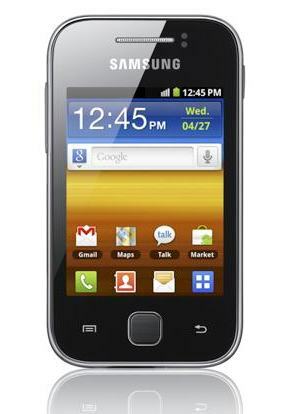 Previously, Galaxy Mini is the cheapest variant in Galaxy Family but now is replaced by the Samsung Galaxy Young. Will this product will be as successful as Mini? How the performance? What are the pros and cons? If you want to know, read this review further more. The word “Young” on the name means that this phone is likely intended for younger consumers. However, judging from the design, Galaxy Y model is quite simple and little bit look elegant like its older brother, Samsung Gio. There are several colors available on the market, which are Black, White, Silver, Pink and Orange. However, some colors option might not available in your Area. Samsung Galaxy Young size is 104 X 58 x 11.5 mm, the weight is 97.5 grams. This phone is comfortable to hold, light weight and of course it will slip easily in your pocket. The entire body is made by plastic, well it’s not surprising consider the price; the Galaxy Note body is made by plastic too anyway. 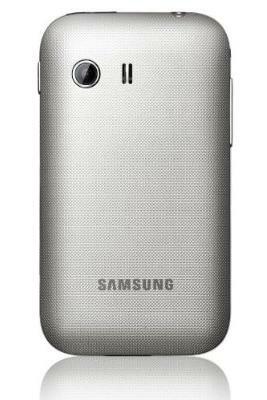 The back of Galaxy Young is textured like most of Samsung Android lately. It quite helpful to make the phone not so slippery and it hide fingerprints. The loudspeaker hole is located next to the 2MP camera lens. On the left side, there are volume buttons and the holes for accessories or for strap. On the right side, there is only a power button that also has a function to lock screen. At the top, there are 3.5 mm audio jack and a micro USB port. At the bottom, there is only a microphone hole. The screen size is 3 inches with resolution 240 x320 pixels. The screen type is capacitive that is responsive to finger (skin) touch. It supports multi-touch up to two points. The displayed colors is fairly standard, it looks a bit pale and have poor contrast. The text and image looks not so smooth because of its low resolution. The screen quality could be better, but because this is an entry level phone, it’s still forgiven and after a while using it, you won’t be bother about the quality. Galaxy Y using an 832 MHz processor, 290 MB RAM plus Broadcom GPU (Graphics Processing Unit). When we tested using synthetic benchmark application Quadrant Standard, this cell phone get score around 1100 and when we tested using Neocore, it gets 41-43 FPS (frames per second). In general, if the Android phone is able to run Neocore application, it can also run 3D Games. Thus we tried to install some 3D games for Galaxy Young from various genres such as soccer games, RPG games and Racing games. All games can run pretty smooth without a problem. Combination of high speed processor (in its class), Android Gingerbread OS plus low resolution screen makes this phone has snappy performance for everyday use. Samsung Galaxy Young equipped with 2 MP fixed focus camera and no flash light support. This phone doesn’t have front camera. If the camera is used to take close distance object, for example to take a written text, the result will be a little blurry because the camera has no auto focus function or the focus distance can not be changed. The overall camera quality is fairly standard, not good nor bad. The resulting image looks a little pale and low detail if we see it using computer. However, if the images displayed on the phone screen, you can say the quality is acceptable. This Android phone can record video up to QVGA resolution (240 x 320 pixels) at 15 fps (Frames per second). When used to record fast moving objects, the result not so smooth. Just like image quality, the resulting video is only good when viewed through the phone screen. It is clear that this Galaxy Y is not a camera phone. If this feature is important for you, then it seems that this gadget is not suits you. But, if you need the camera and video only for capture everyday event and upload it to Facebook or other social media service, then it is sufficient enough. Samsung Galaxy Y loudspeaker quality is pretty good and clear but nothing special. Placement of the speaker hole at the back of the phone is a downside because it will muffle the volume if the phone is placed on the soft surface such as bed or sofa. But most of phones nowadays are same anyway. The audio quality when using headset is much better than the loudspeaker. Music player application interface is simple. You can sort the music files by artist, by album or you can make your own playlist. To enhance the sound quality, there are several preset equalizer you can choose, such as Normal, Rock, Classic, Jazz, etc. There is also 5.1 channel selection to create surround sound effect, even though we didn’t feel the “surround” effect too much. Galaxy Y uses 1200 mAh Li-Ion battery. Because it uses Lithium Ion battery, this phone can be charge anytime, no need to wait until battery exhausted. The battery life performance is so-so if compared to other Android phone. If it used to make a call less than an hour, browsing internet for an hour and used for other usage such as playing games, watch video player, etc for an hour, this Android phone can only last for one day in single charge. Note: the battery life is also determined by telecommunication provider signal strength. Other: GPS (A-GPS), FM Radio, proximity sensor, compass, Accelerometer sensor, Document Viewer. Samsung Galaxy Y price is not so much different from “stupid” phone (the opposite of Smartphone :D). If you never used a Smartphone (phone that use operating system), this phone is perfect for your stepping stone. You will instantly realize the difference and find out whether the latest advance technology is suitable for you or whether you would prefer a simple and practical thing like most of non operating system phone. Samsung Galaxy Y price is different in many countries, but for unlocked type, it sold around 120 USD. The Samsung Galaxy Young that we reviewed is a GSM version. There are slightly differences in specification for the CDMA version. The difference is the network (GSM or CDMA) and the CDMA version has slower processor, which is 600 MHz.